At the completion announcement event of “Heisei Riders vs Showa Riders Great Kamen Rider Wars feat. Super Sentai”, Hiroshi Fujioka and his fellow cast members talked about their feelings on filming the movie. 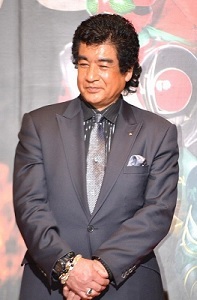 Hiroshi Fujioka, who played Takeshi Hongo/Kamen Rider 1, appeared at the completion announcement event of the new movie “Heisei Riders vs Showa Riders Great Kamen Rider Wars feat. Super Sentai” that took place on March 12th. Fujioka, who transformed once again after 38 years said “It was very emotional. All of the memories came back and my body trembled”. Talking about the Heisei Rider actors who appeared with him, he said “The filming felt fresh and everyone looked confident. I celebrate that the younger people can grow”. 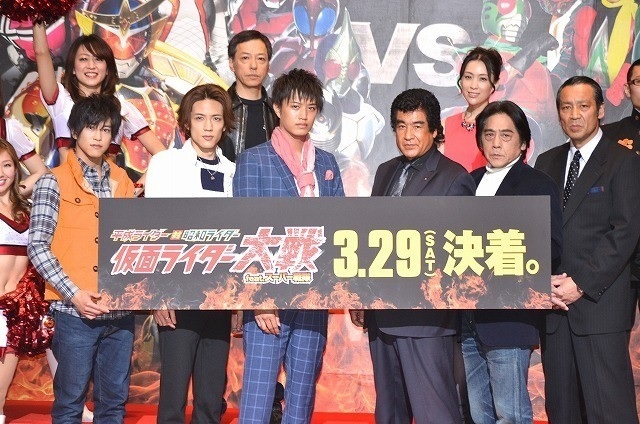 The event was also attended by Gaku Sano, who plays Kōta Katsuraba/Kamen Rider Gaim; Masahiro Inoue as Tsukasa Kadoya/Kamen Rider Decade; Kento Handa, who played Takumi Inui/Kamen Rider Faiz; Ryo Hayami reprising his role as Keisuke Jin/Kamen Rider X; Shun Sugata, who also reprises his role as Ryo Murasame/Kamen Rider ZX as well as newcomer Itsuji Itao, who plays Ren Aoi/Kamen Rider Fifteen and Akiko Hinagata playing his wife, Saki. Sano said: “I was really nervous. Fujioka performed his own action sequences and I confirmed that was the difference that makes him Rider 1”. Fujioka got flustered at Sano’s admiring look. Also, Itao, in regards to his long desired transformation, said “I happened to see the first airing when I was 8. From that moment I dreamed of becoming a Kamen Rider and now, 42 years later, the dream has come true. And I even got paid for it. There is no greater happiness”, making the audience laugh. The movie will show the forbidden battle between the 15 Heisei Riders, including the most recent Kamen Rider Gaim, against the 15 Showa Riders, headed by Kamen Rider 1. The victorious faction will be decided by a fan poll. The movie, Heisei Riders vs Showa Riders Great Kamen Rider Wars feat. Super Sentai, will be released on March 29th. Would LOVE to see the movie! Hiroshi Fujioka still looks fabulous. Going to be bummed out if this movie will only be seen in Japan. Hiroshi Fujioka looks fabulous! !